The emerald ash borers are coming (eventually)! You are here: Home / Growing Knowledge / The emerald ash borers are coming (eventually)! If it’s not on your radar yet, it will be soon: The age of ash trees (Fraxinus, sp.) in the United States is winding down as the emerald ash borer (EAB) slowly follows a western route across the country, leaving a path of destruction in its wake. Though Oregon is currently unaffected by EAB (Agrilus planipennis Fairmaire), the eventual arrival of the insect to the West Coast poses a significant threat to Oregon’s urban ecosystems, which have a high number of ash tree species. Additionally, EAB impacts Oregon’s nursery industry as the market demand for ash trees declines and other trees gain market share. The spread of EAB over long distances is attributed to the movement of firewood and other infested wood products, prompting quarantines across the country to slow its movement. EAB insects bore into the bark of an ash and tunnel through the vascular system, killing the tree. Once infested, a tree is likely to fail. Using principles of integrated pest management (IPM), the Oregon Department of Forestry (ODF) has begun implementing monitoring systems for the pest. There have been no occurrences yet, but the traps play an important role for initial detection when the pest arrives. Though EAB’s destructive arrival to Oregon is inevitable, its impact can be minimized with smart management of urban ecosystems. Ash trees have traditionally been revered as a good choice for street trees due to their shade, fast growth, and ornamental foliage. They have been planted far and wide in Oregon’s cityscapes. The stressful environment of a city, however, makes it a good breeding ground for an insect invasion, leaving an abundance of ash trees at risk. Besides losing a plentitude of urban forest benefits, local communities can also expect an increased public-safety risk as dead and dying ash trees become hazardous to people and property. A heavily infested ash tree detected in Worcester, Massachusetts in 2015. 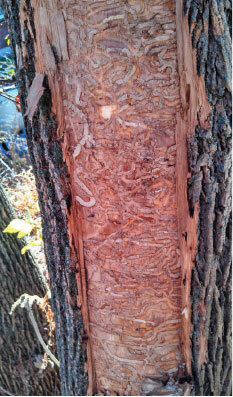 Removal of the bark revealed extensive s-shaped feeding galleries from emerald ash borer larvae. Photo by Tawny Simisky, UMass Extension. Is Oregon ready for EAB? In the summer of 2015, the ODF administered an online survey to urban forest managers in Oregon cities. The goals were to find out what percentage of this population was aware of EAB and to assess preventative actions that have been taken within communities. Alarmingly, 50 percent of respondents indicated they had not heard of EAB in the United States. The same amount was unable to report the number of ash trees within their city, meaning the respondents could not estimate the extent of risk and damage their communities could face. 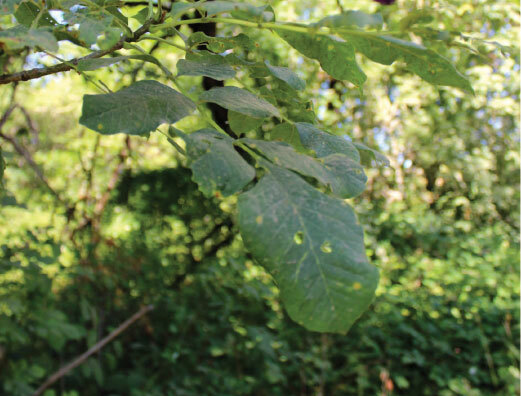 Though survey responses demonstrated the need for increased education among Oregon urban forest managers, several communities did report that they were already considering preventive steps, such as removing ash species from their recommended street tree list. Even though EAB will not be arriving in Oregon tomorrow, it is certainly not too soon for municipalities to begin preparations. The following management plan offers Oregon urban forest managers a comprehensive idea of how to handle the emerald ash borer before and when it arrives. 1. Know the ash resource. A community’s urban forest managers should be aware of all potential infestation sites and make sure their ash tree inventory is up to date, including information on general health and condition. • Discontinuation of planting ash trees. A city may choose to remove all ash species from its list of approved city trees and create a local ordinance that prohibits planting ash. • Replacement of ash trees. This is a good opportunity for managers to increase plant diversity by incorporating non-ash replacements into replanting efforts. • Removal of ash trees. Sadly, ash tree removal is a necessary evil in order to protect Oregon urban forests. Instead of removing any ash tree, however, strategically target only the trees at highest risk. Inventory data such as age, health, structure, and hazard potential can be used to weight the severity of an individual ash tree’s risk of failure. In the absence of a target risk, the healthier specimens should remain in the cityscape, as they have the most defense potential against the pest. • Monitor for insects. As emphasized in the principles of IPM, keeping track of an insect population is an important part of its control. “First responders” need to be ready with a management plan as soon as EAB is initially spotted. The best approach to monitoring pest communities is by setting up traps. Once we find an emerald ash borer in a sticky trap, we know the epidemic has arrived. • Recognize signs of the pest. 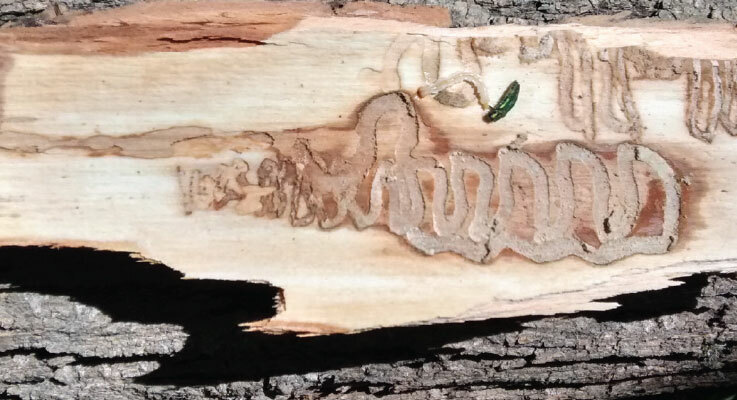 The movement of emerald ash borer larvae leaves behind S-shaped galleries visible in infected tree bark. The insect eventually exits the tree by burrowing through a D-shaped hole. 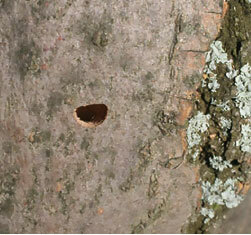 Spotting these distinct holes and galleries in an ash tree can provide evidence of EAB. • Become an Oregon Forest Pest Detector. Oregon State University Extension offers this certification program that trains individuals to identify pests and their signs and symptoms on trees. Giving industry professionals and concerned citizens the right tools to help in early detection will better position the overall response and management effort for EAB. 4. Respond to infestation. Just as the ODF has prepared a thorough and collaborative response plan for EAB, so should every community be prepared to respond once the pest arrives. After initial infestation, it may take 1–3 years for an ash tree to completely fail. Larvae may have already imposed significant damage to the tree even if it is not yet visibly declining. This is a good time to prioritize inspections for trees that present hazards to people and property. 5. Public education and awareness. The education and awareness process should begin within the nursery industry and then spread throughout the community. Outreach examples should involve local news outlets like magazines, city websites, and social media. An educational campaign should accomplish two goals: alert people about EAB and encourage community participation in tackling it. It is important to know how to identify affected ash trees and how individual behavior can affect the epidemic. A city might consider establishing an online reporting system that facilitates identifying ash tree locations and possible pest sightings. 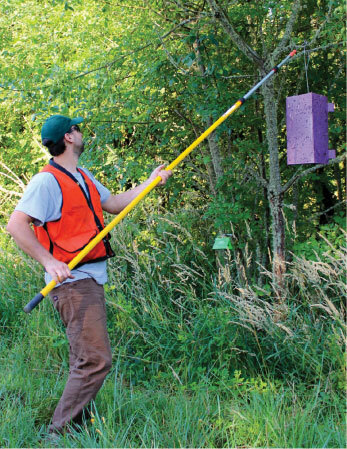 Oregon urban forest managers have a unique opportunity to minimize the potentially devastating impact of an impending harmful insect invasion. While there appears to be no way to prevent the arrival of the pest, this report has offered several methods that will help to prepare communities and to reduce the overall impact. Sarah Greenleaf was a graduate student at Oregon State University in the College of Forestry and is now a state forester in Massachusetts. She can be reached at sgreens22@gmail.com. The author wishes to thank Paul Ries and Wyatt Williams for their advisement in this report. 1 (Buhl et al., 2014). 2 DeSantis, R.D., Moser, K.W., Gormanson, D.D., Bartlett, M.G., and Vermunt, B. (2013). Effects of climate on emerald ash borer mortality and the potential for ash survival in North America. Agricultural and Forest Meteorology 178-179, 120-128. 3 Nowak, D.J., Crane, D.E., & Dwyer, J.F. (2002). “Compensatory value of urban trees in the United States.” Journal of Arboriculture, 28: 194-199.